I decided to throw on a chambray shirt to continue with the vintage feel of the skirt and tied it up to keep it a bit cooler. I was originally going to throw on some booties with this outfit to keep it casual but it was a bit too warm out so instead I threw on my favorite wedges trying to keep it semi casual. Not going to lie, it wasn't my best hair day yesterday so excuse the boring hair! I've been trying to use less heat on it, especially since the air is getting dryer, so I'm still trying to figure out how to style it without my heat tools. Any suggestions? I mean it has pockets and it's red! That is like total perfection in my book right up there with that picture of you leaning up against the bridge with that gorgeous smile! This is probably one of my favorite outfits of yours!!! I love that last photo of you...so glamorous!! I agree with Amanda...I always put my hair (wet) in two braids before bed and let them out in the morning and beach waves galore!! Oh my gosh you are absolutely stunning! This vintage look is so classic, and I think it is one of my favorite looks of yours! I have no hair tips, haha but I think I want to try Biana's and Amanda's braid idea! What a pretty outfit!! You look fabulous, and I love how you put all of it together. Fingers crossed for cooler temperatures soon! Love the knotted chambray + the midi skirt. And what a pretty color! The color block sandals are the jam, too. Great look, babe! Love this look! Such a cute midi! ok and now i need this skirt!! Gorgeous look! It can be tricky pairing blue and red together but you absolutely nailed it! You look absolutely adorable! 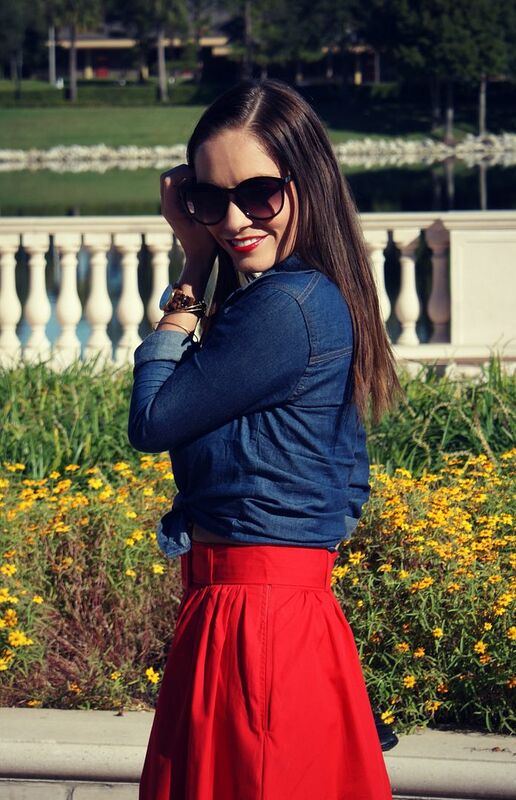 Loving that bright red midi with the tied chambray top! Oh my GOSH! This outfit is so perfect for you! My fave! Love it! I love the color of this skirt and what a great transition piece! Such a great outfit. I love the color of the skirt with your shirt being knotted! Such a cute look! I was just thinking about busting out the midi too! 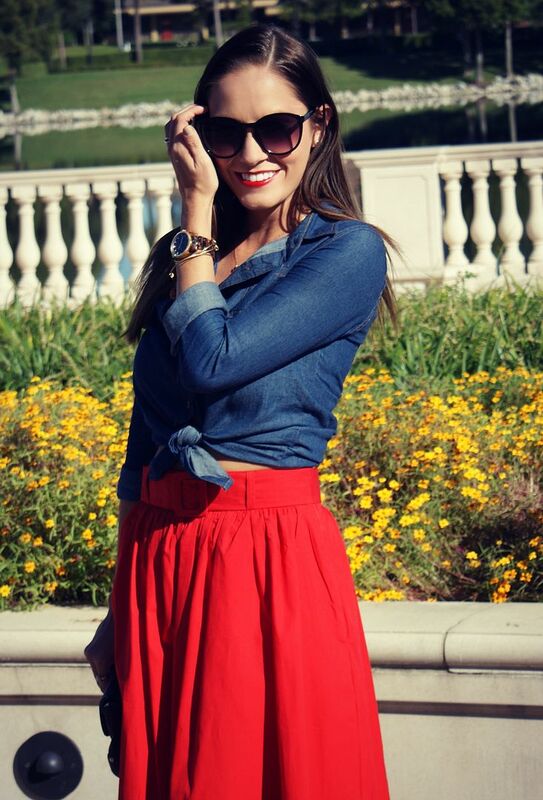 Love the red and chambray! This is such a beautiful look, I absolutely love your skirt, and the color, my goodness! And your hair looks really great in these photos! GORGEOUS!!! This is my favorite look on you! 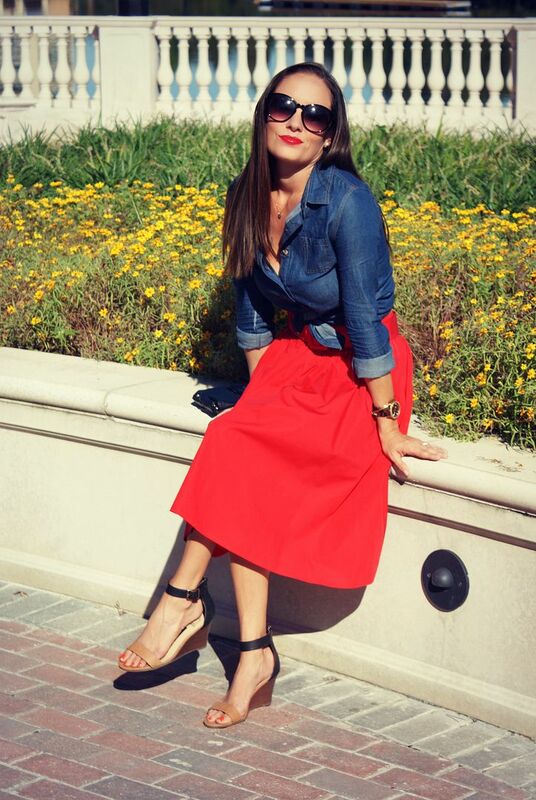 I love the red midi skirt especially with the chambray! So retro chic! I know it's an investment but I do swear by Kerastase hair products. I use the Oleo-relax serum right after I wash my hair, pull it into a damp bun and then let it air dry and there's no frizz. A bottle usually lasts about six months because you only need a very small amount. Oh, and it smells divine! I am obsessed with this out! 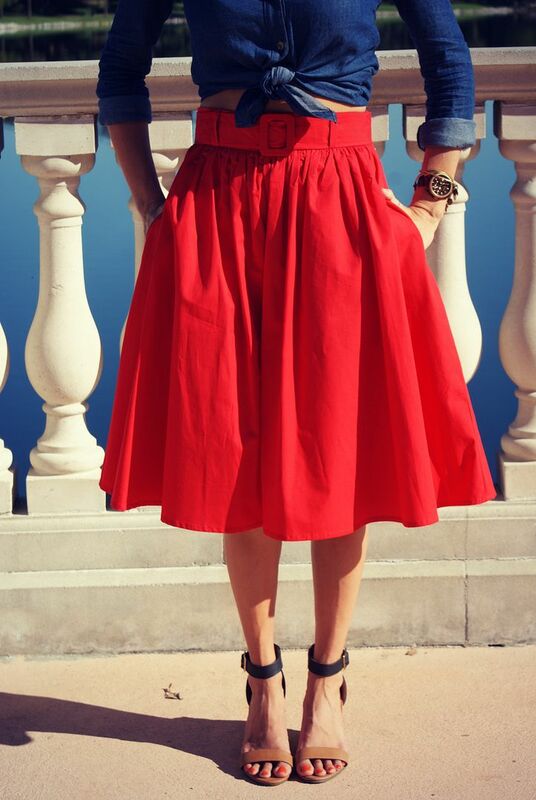 Love the fuller skirt and red is always a win in my book! I LOVE this whole look! The red and chambray is so fabulous! I also love hair! You can do so much with it and it really doesn't look affected by heat and humidity at all! Do you use sea salt spray? This is definitely my favorite outfit of yours Pamela! You look so ladylike and gorgeous! I'm petrified to do the midi skirt, but the way you styled it makes me want to jump on the trend! Totally obsessed with your skirt! You look amazing! Fantastic red skirt! Love it with the denim! Seriously cute outfit! LOVE that skirt! GORGEOUS! I love this outfit! It looks amazing on you! 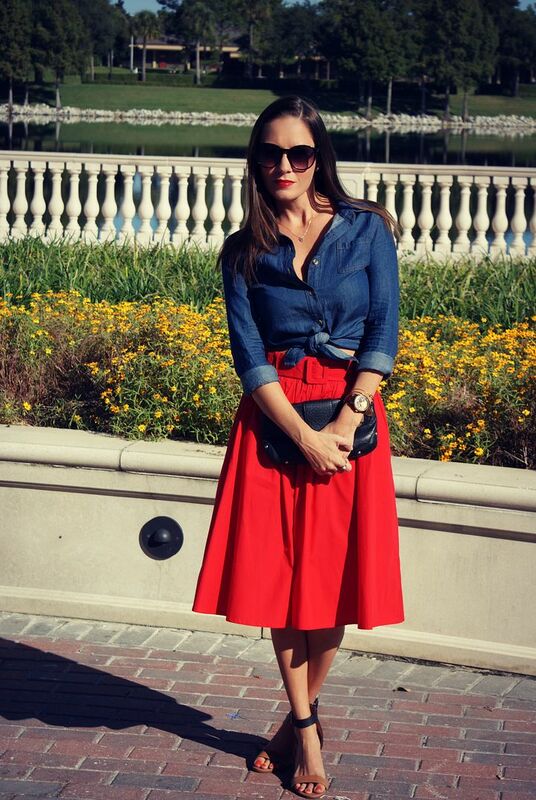 I love how you knotted the chambray shirt, it balances out the midi skirt perfectly! This is perfection. A skirt with pockets?! Yes please!